I skimmed it after the first few chapters. 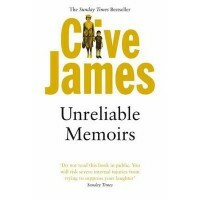 James' dry Antipodean wit is in evidence throughout, but I found this story of his early years rather dull overall, and I thought he placed too much importance on scatological detail and the awkwardness and, well, grossness, of his sexual awakening for my taste. The book would probably go down better with men and women of his generation who are fans of his TV work. I used to greatly enjoy watching his review of the year every New Year's Eve with my parents, and I think I'll probably enjoy Flying Visits, my next read by James, a great deal more.